Greenwood Village, CO – June 1, 2018 – Payroll Vault Franchising is excited to announce its newest location in Santa Barbara, California. 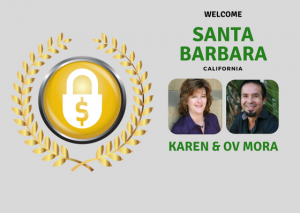 Karen and Ovidio Mora, a husband and wife team, are new Payroll Vault franchise owners and excited to begin their business and dive into the industry of payroll services with the Payroll Vault brand. Karen Mora, Founder/CEO of Accountability Plus, started her bookkeeping/payroll firm in 1999 with ‘client relationship’ always at the forefront of her purpose. Karen’s high value for relationship is evident with her first employee, friend and professional Rita Holden, who remains her longest-term employee today. Karen’s bookkeeping and payroll experience includes 10 years at a Silicon Valley commercial real estate firm and 5 years working for two Santa Barbara CPA firms. Her business affiliations include former President of the National Association of Women Business Owners – Santa Barbara Chapter, former Vice President and current member of the American Payroll Association – Santa Barbara Chapter, former President of the Santa Barbara Bookkeeper’s Association, and former payroll Instructor at Santa Barbara City College. In her free time, Karen enjoys scuba diving, reading, gardening and traveling to Costa Rica with her husband. Ovidio Mora immigrated to the United States from Costa Rica in 1988. He worked in food services in Florida, Oregon and California where he met and married Karen. Mora joined the Accountability Plus team in 2002 as the outside liaison and “face of AccPlus,” and is fondly known as “OV”. He enjoys scuba diving, running, and socializing in his free time, and has completed 22 marathons. Karen and OV are tremendous partners and they make an unbeatable team.